Read about the main features of our latest release such as agentless monitoring, new networking plugins, workflow queueing, Kubernetes networking integrations, and the cool new deployment wizard. Cloudify 4.5 comes with out of the box Nagios integration (which we alluded to last release) to enable agentless monitoring by tracking SNMP events and traps, simplifying the monitoring of existing network appliances that do not support agent-based monitoring. 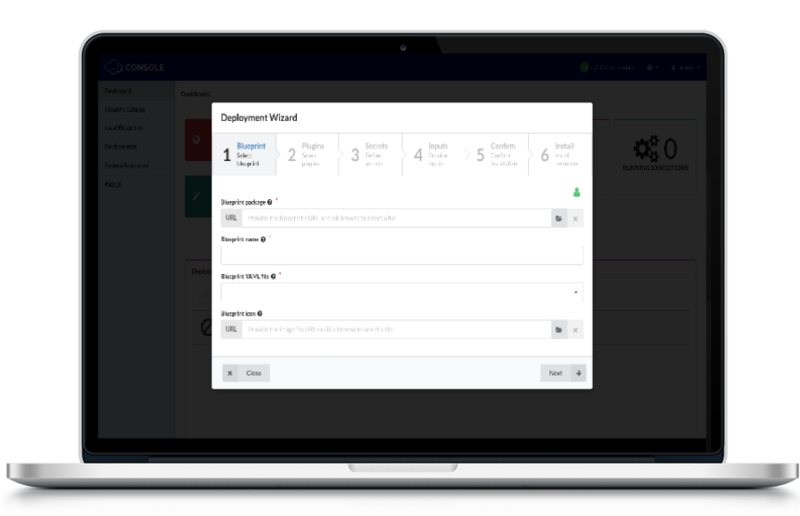 We made it even easier for users to get started with a simple step-by-step wizard to walk you through your deployments. It checks for plugins, secrets, inputs, and anything else for your deployment. Every Cloudify Manager installation requires a PostgreSQL database to store its required data such as blueprints, deployment, tenants, and more. By default, Cloudify Manager is installed in an all-in-one topology, however, as part of Cloudify’s progression towards a microservices architecture, users can select to use an existing PostgreSQL external database, or use Cloudify’s PostgreSQL package and installation methods. One of the great new features we have added is the ability to queue a workflow by adding the "--queue" flag to an execution "cfy executions start ". A queued execution starts as soon as it can and users can cancel queued executions. We added a pluggable framework enabling users to add hooks on workflows, with an out-of-the-box implementation of SNMP traps for workflow-related events. For example, if a user wants an email notification upon a failed workflow, simply configure that and any time that workflow event occurs, an email will be sent to the user. In order to ensure your credentials are kept safe, we have enforced encryption of all external and internal communication to and from the manager as well as for the secret store. We also added new Kerberos authentication to ensure maximum isolation of every execution. Cloudify also allows users to dynamically manage multiple networks for added network isolation between different users and deployments.